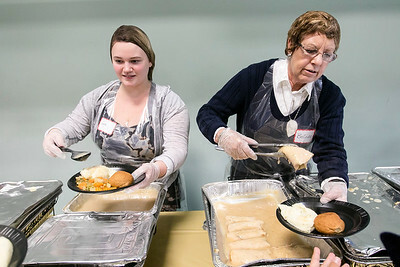 Sarah Nader- snader@shawmedia.com Volunteers Jennifer Fullman (left) of Crystal Lake and Belinda Wadas of Woodstock serve a meal to families in need at the second annual community Thanksgiving dinner at the Salvation Army in Crystal Lake Wednesday, Nov. 23, 2016. 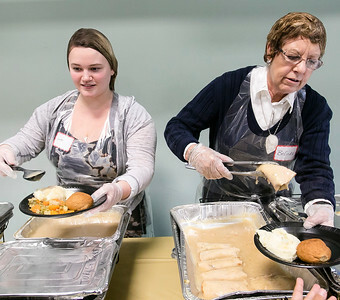 Sarah Nader- snader@shawmedia.com Laurie Steward (right) of Crystal Lake and her caregiving Katie Davis of Wonder Lake enjoy a meal while attending the second annual community Thanksgiving dinner at the Salvation Army in Crystal Lake Wednesday, Nov. 23, 2016. 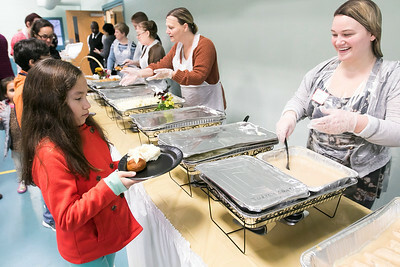 Sarah Nader- snader@shawmedia.com Valentina Camacho (left), 9, of Crystal Lake hands her plate to volunteer Jennifer Fullman of Crystal Lake while attending the second annual community Thanksgiving dinner at the Salvation Army in Crystal Lake Wednesday, Nov. 23, 2016. 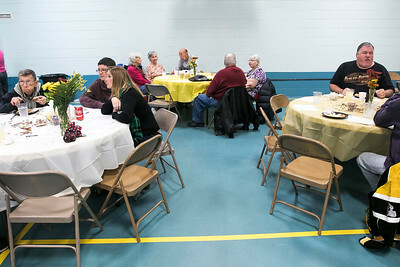 Sarah Nader- snader@shawmedia.com Families enjoy a Thanksgiving meal at the second annual community Thanksgiving dinner at the Salvation Army in Crystal Lake Wednesday, Nov. 23, 2016. 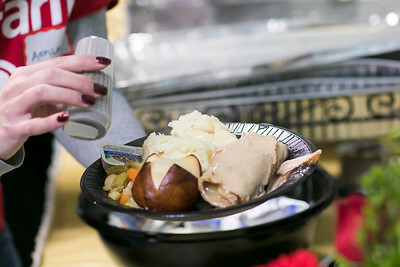 Sarah Nader- snader@shawmedia.com The second annual community Thanksgiving dinner was held at the Salvation Army in Crystal Lake Wednesday, Nov. 23, 2016. 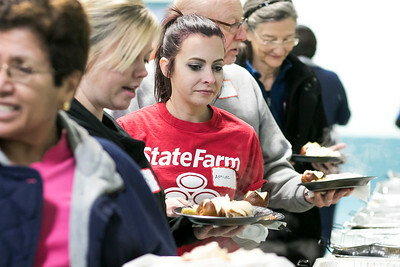 Sarah Nader- snader@shawmedia.com Volunteer Ashlee Clark (center) of Crystal Lake lines up to get food after volunteering at the second annual community Thanksgiving dinner at the Salvation Army in Crystal Lake Wednesday, Nov. 23, 2016. 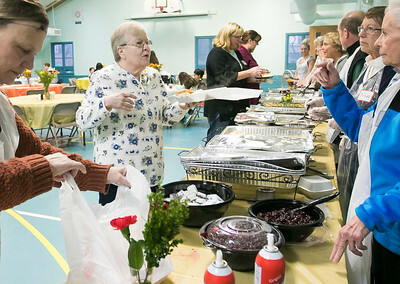 Sarah Nader- snader@shawmedia.com Joy Schneiderwind (center) of Crystal Lake lines up to get food at the second annual community Thanksgiving dinner at the Salvation Army in Crystal Lake Wednesday, Nov. 23, 2016. 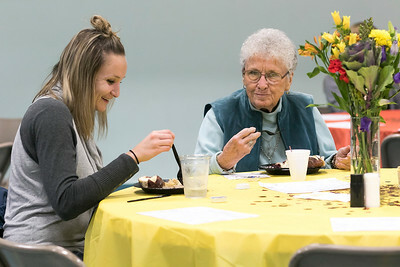 Laurie Steward (right) of Crystal Lake and her caregiving Katie Davis of Wonder Lake enjoy a meal while attending the second annual community Thanksgiving dinner at the Salvation Army in Crystal Lake Wednesday, Nov. 23, 2016.